At the beginning of every new year, and 2019 is no exception, we see many posts with the slogan “New Year, New You”! What makes life so different on Jan 1, from Dec 31? And it got me thinking…. I don’t believe in New Year resolutions, I don’t know of anyone who keeps resolutions past the first few weeks despite the best intentions. So how do I make an impact in 2019? As we know, and as statistics have proven, very few people keep their new year resolutions! I’m not about to recite any statistics, I will let google do its thing if you are interested. So does the new you really hold water if it is Jan 1? Or how long does it hold for you? Maybe you are different, it is very possible! But I think there are much better ways to improve ourselves permanently if we do it because we want to, because we are committed to ourselves and not because it is date driven. So instead of making a new year resolution, I decided to make a renewed commitment to myself to focus on my mental and physical health. To be the best version of myself. To be unlimitedly fabulous - from inside and to believe it, every day. Now that is a commitment I can carry through the year into next year and next - something I can work on improving continually. It is a commitment I am hoping to inspire you to join me in. Like my LinkedIn Post the first week in Jan said “Be uniquely YOU. Be unlimitedly fabulous”! I attended a training session for a side gig with Nerium Canada and our National Marketing Director spoke and she said something pretty impactful - “what do we need to do more of and what do we need to do less of to make us more successful”. It resonated with me and really made me think of my commitment. There are definitely things I need to do much less of and some things I need to do more of. And starting with doing less of is one the most important starting points, getting rid of some of the cobwebs by stop doing things, you can see a little more clearly and formulate a plan to better mental health. At least this is what I needed to do. In 2018 we have seen a lot of emphasis on mental health with the suicide of Kate Spade and Anthony Bourdain but what actual steps have you taken to improve your health? More importantly, what steps do you need to take? So where did I start with my commitment? I started with less like mentioned before! Less toxic people and things that doesn’t add value but instead add stress. I’ve started by eliminating toxicity and negativity and the impact it has on my life! It is amazing how much clarity and calmness that alone has brought - and this is allowing me to add MORE and to doing MORE! I am finding myself sleeping better and I am more motivated. Even with fewer hours sleep some nights, I have felt more rested as I sleep soundly. No more distressed sleep! Isn’t that profound? And amazing?! Sometimes we get caught up by the fog of the negative things in our lives, it overshadows who we are and if we can figure out what causes the shadows then we can remove them. Even if we remove one negative thing from our lives, one thing that causes us distress or worry, we find calmness which opens us up to possibilities. Knowing what matters most to us, is what helps us be healthy - sometimes we lose track. And it is important to take stock now and then. I have a renewed sense of purpose and commitment! A commitment to myself, my health, my family and my career. My commitment is to the people that matters to me, that I will be present and real! All in all in a nutshell, my commitment is to be unlimitedly fabulous, starting on the inside! Join ME..
Time OUT - ME TIME increase Fabulousness!! Mental health is important - but how do we achieve it! With a busy lifestyle and so many distractions and so many things to do all the time. How do we find time for us. This is how I recently made time for ME! I want you to try and take time for YOU! Purposeful & Fabulous Giving BACK! Wow! What a terrific day Sunday. The close to a terrific week full of excitement and the day did not disappoint. In my previous blog post, I mentioned my participation in the Ride with Wheels for the Darling Home for Kids. And what a ride! 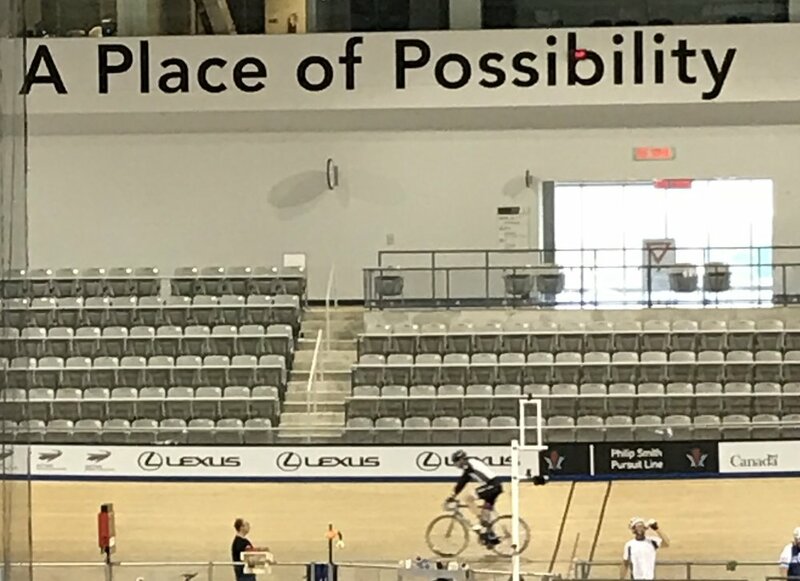 I loved the slogan at the Mattamy Stadium in Milton, our starting point... "A Place of Possibilities" It was so fitting to the day and the whole purpose for doing this ride! Everything the Darling Home does for families, opens up possibilities for parents and kids. So its very fitting indeed. What a fantastic experience - riding 50km in pouring rain but doing it with the ringing of the voice of one specific girl's parents in my ears... it made it more than worth it. Knowing what the Darling home meant to this family gave me the adrenaline and endurance I needed, in the few moments I needed the extra burst of encouragement. Every time the rain hit my face and ran into my eyes, my legs burning, my lungs burning I just needed to think of the reason and I had more energy to keep cycling! I have not run a marathon since my late teens, or done anything that requires this much endurance. But how thrilling and exciting. Doing something that makes us feel alive like my friend Monique says, is important! I may have forgotten the feeling a little! And this made me feel completely alive. Living on the edge, pushing my limit, exceeding my limit. I never thought I'd be able to complete 50km's but I did! Despite exhaustion, the last few km's as I started to get the end in sight and recognized the road names, a smile broke and nothing could stop me smiling. This was no "Oops I did it again" like the Britney Spears song - but this was a purposeful YES I DID IT!!! I couldn't have worn a bigger smile the entire day. What have you done lately that makes you feel alive? Makes you feel like you have a pep in your step? What makes you feel like you have purpose? Find a purpose, find a reason! Do something you wouldn't normally do - step out of your comfort zone and onto the edge! A huge thank you to all of you who donated and volunteered - from the bottom of my heart, thank you! Your donations helped my team raise more than double our goal and I personally raised more than than my personal goal (which I did raise half way through) - we could not have done it without you. And these funds will help Darling Home do some much needed upgrading where needed. Till next time folks, be fabulous, be unlimited fabulous! Exceed your limits and do it fabulously! happy Wednesday - 5 days to THE rIDE! Being able to give back is the essence of life. It is a way of paying it forward! Find a cause close to your heart!